You wonder “why”? Well, the jerky you buy from the supermarket contains a high amount of sodium to preserve it and it is injurious to your health. Will it stop you from taking this delicious food? No. If you want, you can easily make jerky in your home. To do so, along with your other ingredients, you will be in need of the equipment named food dehydrator. What is the Best Food Dehydrator For Jerky Making? Well, it is very tough to answer the question from one perspective only. Some people are running on a budget, so they need a cheap dehydrator for jerky, someone needs a bigger one to allocate a good quantity, and someone wants a dehydrator of great features with high price. Again, someone hunts for a particular model which is cheap, large storage as well as easily match up with their counter top. ​Jerky is a great snack if you can manage its ingredients. The packet you buy from the store is processed item, and you cannot do much about it. To have a healthy, high protein snack, you have no other option left but to make jerky in your home in the dehydrator. 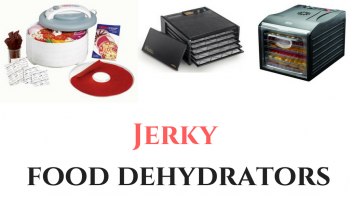 Here are the reasons why you should use a dehydrator to make jerky in your home. In your homemade jerky, you can control the amount of sodium when processing the meat. You can ensure that the temperature is high enough that no pathogenic bacteria will survive. You will use fresh meat. No added preservative, no artificial chemicals (like sodium nitrite) to preserve it for a long time. These are the three basic drawbacks of readymade jerky, and you can easily avoid them if you make them in your home. Tip: Need Jerky Gun? then have a look on our best Jerky Gun Reviews post. ​Unique Parallax Horizontal air flow system is working in this gadget to ensure an equal heat distribution in each and every single corner of every tray. There is a fan located in the rear which draws some cold air from the atmosphere and speeds up the dehydration process. You can make a lot of jerkies precisely within a very short time. 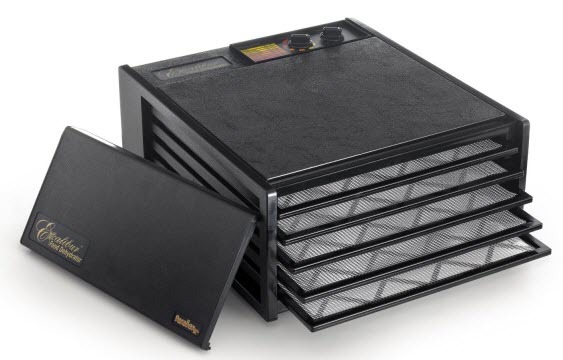 ​The Excalibur 3926TB comes with nine trays; total drying surface is 15 square feet. You can also remove the trays to allocate any oddly shaped food items. What else do you want? ​I fall in love with this product with this amazing feature. This technology ensures the maximum preservation of food nutrition and enzymes and keeps a really good care of your food item. Again, it destroys any bacterial function which may spoil your food. ​The Excalibur 3926TB comes with ten years of manufacturer warranty. Pretty huge, isn’t it? It is a pricey product, but the warranty ensures the safety of your investment. Type of Dehydrator: It’s a stackable shelve dehydrator with nine consecutive high-quality trays. ​Air Flow Mechanism: The Excalibur 3926TB runs with parallax horizontal air flow system. ​Temperature Range: The temperature range is 105°F to 165°F. ​Product Dimension: The Excalibur 3926TB is a little bit bigger in size. The dimension is 19*17*12.5 inches. ​Adjustable Trays: There is no option of adjustable trays as it already provides huge dry space to its consumer. ​Power Capacity: It works with 600 watts power. ​Manufacturer Warranty: 10 year of manufacturer’s warranty. ​Total Weight: Total weight of The Excalibur 3926TB is 22 pounds, and the shipping weight is 23.2 pounds. ​Why is it good for jerky? Quality temperature control and dehydration which is a must for a good jerky processing. Excellent drying surface with a poly screen to ensure efficient heating. The Excalibur 3926TB ensures the food value and flavor of your meat slice to have a delicious as well as nutritious jerky. Easy to use, maintain and clean. Very flexible operation with the thermostat and the timer. Huge drying space of 15 square feet. Sometimes a little bit noisy. The box does not include the solid sheets. The controller is at the back which a major drawback of its design. ​The dehydration system of the Excalibur 3926TB is excellent. It has plenty of space, easy to operate which makes it a perfect unit. The price is out of middle-class range, and the size is not suitable in every countertop. The jerky you will make in it, will be top notch. Consider the price, size, and your budget; the decision is yours. The Nesco FD-1040 Gardenmaster has horizontal air flow and heat distribution system which is rare in the dehydrator of this price. The patented converge air flow system makes sure that the trays are drying equally. No need to check or rotate the trays. Just place it and let the machine do the rest. The adjustable thermostat will let you control the temperature from 90°F to 160°F. You can dehydrate fruits in low temperature as well as can make delicious beef jerky in high temperature. It has four trays with the box, but as per your requirement, you can set up to 20 trays. You are allowed to dehydrate a huge amount of food items in a single cycle with the Nesco FD-1040 Gardenmaster. ​Air Flow Mechanism: It has horizontal air flow system. With the top mounted fan, it creates parented converge air flow to heat the food items equally. ​Temperature Range: The temperature range of the Nesco FD-1040 Gardenmaster is 90°F to 160°F. ​Product Dimension: The product dimension is 15.5*15.5*9 inches. ​Adjustable Trays: Yes, Up to 20. ​Thermostat: Digital thermostat with a programmable timer. ​Power Capacity: The power capacity of the Nesco FD-1040 Gardenmaster is 1000watts. ​Manufacturer Warranty: One-year-long manufacturer guarantee is available with it. ​Total Weight: Total weight is 8.9 pounds while the shipping weight is 9 pounds. Temperature and timing are very important for a well-processed jerky. The digital thermostat and the programmable timer will help you to make jerky efficiently. No liquid will drip and hamper your jerky processing. 1000 watts motor will provide you sufficient heat and complete the processing within a very short time. Expendable 20 trays will provide huge drying space. Great features considering the price. As the number of trays increases, the quality of dehydration decreases. ​As I said earlier, The Nesco FD-1040 Gardenmaster is a great choice for the busy parents or small professionals who cannot stare at the dehydrator all the time. The digital timer and digital thermostat is its main eye-catching feature of it, and the price is affordable too. Overall, it is a good pick for people who want do make jerky without having much trouble. This is one of the best beef jerky dehydrator. ​Aroma AFD-815B runs with horizontal air flow which ensures a proper distribution of heat in all its trays. You will not need to change or rotate the trays as the air flow move across the trays and dry them equally. ​The dehydrator has a disciplined design which will allow you to dehydrate any foods of any shape. It has six trays, capable of loading 1 pound each. You can remove any of them to allocate your bigger size food item. ​The performance of Aroma AFD-815B is very rare. The mechanical error or heat loss of this gadget is very little. The horizontal heat airflow maintains a good control on the dehydration and preserves the food value pretty well. ​Aroma AFD-815B will allow you to dehydrate in a temperature from 95°F to 155°F. You can use this gadget to dehydrate any of your desired food items. Temperature Range: The temperature range is 95°F to 160°F. This wide range of temperature control system allows you to dehydrate a lot of items. Product Dimension: The Product dimension is 13.5 x 13.8 x 9.8 inches. Adjustable Trays: The Nesco FD-61 Snackmaster comes with four trays, but it is built to adjust up to 12 trays at a time. Thermostat: This dehydrator has an adjustable thermostat. Power Capacity: Nesco FD-61 Snackmaster requires 500Watts of power to work fluently. Manufacturer Warranty: It comes with one year manufacturer’s warranty. Total Weight: Total weight of Nesco FD-61 Snackmaster is 6.8 pounds, and the shipping weight is 6.9 pounds. Innovative design which is suitable for meat dehydration. Horizontal Airflow system ensures equal dehydration. Quality performance by the dehydrator ensures the food value of your jerky. Beautiful design with six trays. Great performance with horizontal air flow system. Large capacity and capable of allocating any shape of the food item. Internal temperature cannot be 160°F. 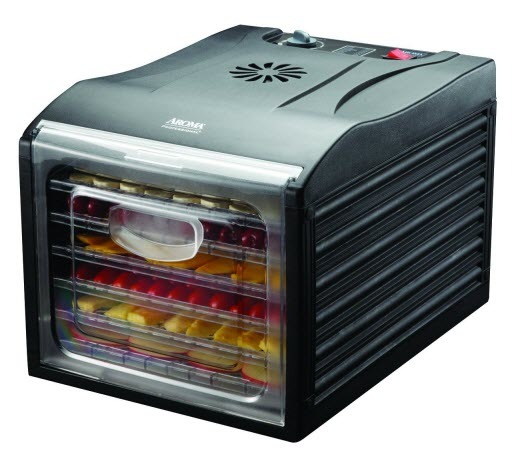 ​Aroma AFD-815B is a great tray based dehydrator for jerky making. They only lack a good timer considering the price. The consumers will be pleased to pay this price if they can get some addition accessories in the box. ​The Nesco FD-75A have a top mounted fan, and it creates a vertical air flow in it. As a result, the top tray gets the maximum importance and dehydration done within a short time. If you are in a hurry and want to do some quick kitchen operation, it will be a great option. ​The Nesco FD-75A comes with five trays but can adjust up to 12 trays. It will provide you a huge storage capacity in one cycle. Again, it will not possess the lion’s share of your counter top as it is small regarding its huge capacity. 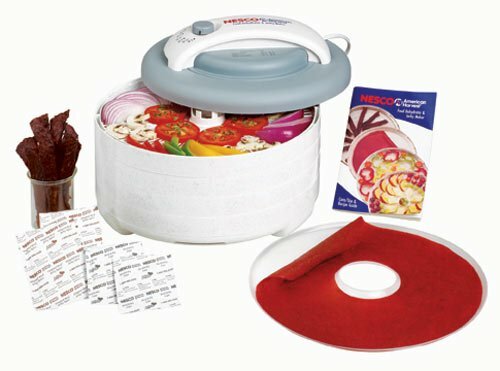 ​This nesco﻿ dehydrator is good for all kind of food dehydration like vegetables, food, jerky and so on. You can set the thermostat at different temperature (95°F to 160°F) to complete the proper dehydration. 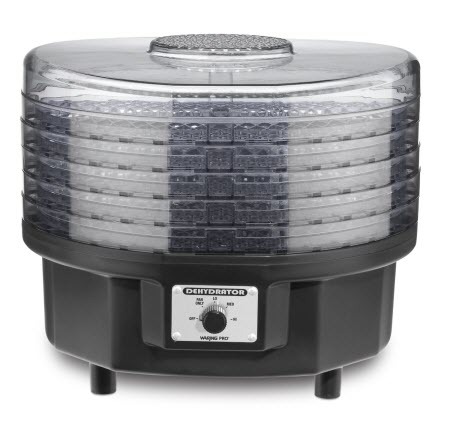 Type of Dehydrator: The Nesco FD-75A is stackable dehydrator with adjustable 12 trays holding capacity. Air Flow Mechanism: It has a top mounted fan to create vertical air flow. Temperature Range: The Nesco FD-75A has a wide temperature range of 95°F to 160°F. Product Dimension: The dimension of the product is 13.8*22.1*13.9 which is pretty small comparing to the other dehydrator. Adjustable Trays: The Nesco FD-75A comes with five trays, but the design allows adjusting 12 trays simultaneously. Power Capacity: The power capacity of Nesco FD-75A is 600 watts. Manufacturer Warranty: The Nesco FD-75A comes with one year manufacturer’s warranty. Total Weight: Total weight of the product is 9 pounds. The shipping weight is 9.4 pounds. Why is it good for jerky? Most of the time, people fail to create perfect jerky because they cannot dehydrate the meat slice properly. In The Nesco FD-75A you can put your slice on the top tray, and after a while, you will find a perfect piece of jerky. The temperature control is pretty good considering its price, and it is a very important feature to make a perfect piece of jerky. A top mounted fan will ensure convenient drying. Perfect size to fit any kitchen. Central air flow is available. You can dry different items without any mixture of the flavors. Very easy to use, shipped with a user guide too. The main drawback of The Nesco FD-75A is it does not have any timer. You have to stay cautious while operating it. There is no on/off switch. You have to unplug/ switch off the main source. Top tray foods will be drier than the lower ones. ​I just looked at the price and the features. Well, The Nesco FD-75A is a great dehydrator for making jerky if budget is your primary concern. You will hardly find such efficient, perfectly shaped jerky dehydrator in this price to make jerky. ​Nesco american harvest food dehydrator and jerky maker is an excellent choice for the people having a mid-range budget. Regarding its price, it achieved a huge deal of consumer satisfaction. It comes with a small budget, but it can process any dehydration within a few hours. It occupies some features which are hard to find in some other costly dehydrator also. Let’s have a look at its key features. ​Nesco american harvest snackmaster encore dehydrator and jerky maker comes with an adjustable thermostat which allows the consumer to vary the temperature in a wide range from 95°F to 160°F. You can dehydrate any product, from green vegetable to meat or jerky, anything you want. ​The heating system of this gadget is Converge-Flow. This innovative system ensures that each and every tray got equal heat simultaneously. ​Nesco FD-61 Snackmaster box will come to you with four trays, but you can adjust up to 12 trays in it. It will allow you a huge storage space. Do not worry about the dehydration quality. The pressure of dehydration will equip with the number of trays and the total weight of the product you want to dehydrate. ​The material of this gadget is completely BPA (Bisphenol A) free materials. This chemical substance happens to present in the plastic material and harmful to human body. 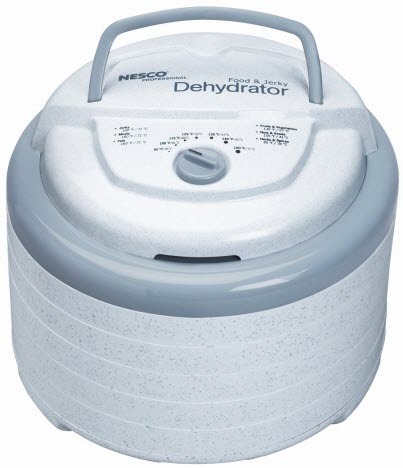 Type of Dehydrator: Nesco FD-61 Snackmaster is stackable type dehydrator. It has plenty of space, and the dehydration system saves you from rotating the trays for a proper dehydration. ​​Air Flow Mechanism: This nesco american harvest dehydrator and beef jerky maker conducts its operation by a Converga-Flow system which ensures equal heat distribution in each of the trays. ​​Temperature Range: The temperature range is 95°F to 160°F. This wide range of temperature control system allows you to dehydrate a lot of items. ​​Product Dimension: The Product dimension is 13.5 x 13.8 x 9.8 inches. ​Adjustable Trays: ​The Nesco FD-61 Snackmaster comes with four trays, but it is built to adjust up to 12 trays at a time. ​​Thermostat: This d﻿﻿﻿ehydrator has an adjustable thermostat. ​​Power Capacity: Nesco FD-61 Snackmaster requires 500Watts of power to work fluently. ​Manufacturer Warranty: ​It comes with one year manufacturer’s warranty. ​Total Weight: Total weight of Nesco FD-61 Snackmaster is 6.8 pounds, and the shipping weight is 6.9 pounds. ​Considering the consumer’s reaction and manufacturer reference, the Nesco FD-61 Snackmaster can be a good pick for jerky. It can make jerky/beef jerky within 5 hours. The converge-flow system ensures 100% dehydration. No need to rotate your jerky. It comes with a jerky gun. Nesco FD-61 Snackmaster is very easy to operate. Dehydration is quicker considering the price. Powerful drying pressure creates by the gadget. Dehydration process is comparatively quite. It is an “All in one” dehydrator. Nesco FD-61 Snackmaster does not have a timer. Thicker food will take some time to dehydrate. No fruit rolls sheet will come within the box. ​Excalibur 3526TB is a great product with its different features. The most important feature of this product which made it better than the previous two is that it comes with a timer. The design is good, and it is a stackable dehydrator. Let’s have a look at its key features. ​The Excalibur 3526TB has the horizontal fan at its back. As a result, the gadget can eventually flow the warm air across the food items to drive out the moisture. In this case, all the trays got equal attention. ​The product has an adjustable thermostat with a wide range of temperature (105°F to 165°F). You can dehydrate you green vegetable at 125°F or make your home made delicious jerky at 165°F. Again it comes with a timer which reliefs you from the tension of overheating. Just arrange the items on the tray, set a recommended temperature and time limit, and let the dehydrator do the rest. ​This Excalibur Dehydrator comes with an excellent and user-friendly design. The trays are easy to remove and clean. There are some extra layers on them to prevent foods from getting stuck. ​Usually, a manufacturer provides one year to five years warranty on a product. But Excalibur 3526TB comes with ten (10) years of warranty which is a good security for the buyers. Type of Dehydrator: The Excalibur 3526TB is a stackable dehydrator with five shelves design. Air Flow Mechanism: The machine has horizontal airflow mechanism to ensure equal distribution of heat. Temperature Range: The Excalibur 3526TB has a wide temperature range from 105°F to 165°F. Product Dimension: The product comes with a dimension of 19*17*8.5 inches. Power Capacity: It requires a 400watts of power to carry on. Manufacturer Warranty: The Excalibur 3526TB comes with ten years of manufacturer warranty. Total Weight:The item weight is 15 pound only, and the shipping weight is 16.9 pound. ​Why It Is Good For Jerky? The trays have poly screen protection which will not let your meat slice to stick. Horizontal airflow will let your meat slice dry up equally from top to bottom. The timer and thermostat will allow you to make the exactly dehydrated jerky you want for your family. It is a great horizontal dehydrator and small enough for household use. Easier to set up in the kitchen or countertop. Excalibur 3526TB comes with a 26 hours timer. Trays are very handy, easy to break. No room for the extra tray. The lower range of temperature is not suitable for some food. The Excalibur 3526TB is a small, well-designed dehydrator with some exciting features. It will ease your dehydration as well as jerky making. The price is a bit more, but if you do not worry about the budget and want a perfect, smooth and efficient gadget, the Excalibur 3526TB will be one of the best dehydrator for jerky. ​Nesco is a trusted brand for dehydrators. The Nesco FD 80A Dehydrator is one of their best models with efficient air flow, top mounted fan, and adjustable thermometers. Let’s have a look at the key features of the Nesco FD-80A Dehydrator. ​The Nesco FD-80A has an exquisite square shape design which is perfect for any shelf or counter top and the amazing outlook make it a good fit as your kitchen appliance. ​The Nesco FD-80A has a horizontal airflow system although it has a top mounted fan. This Converge Flow system makes sure that each and every tray is equally heated. It has the benefit of horizontal air flow system as well as the top mounted fan prevents any dripping to keep your gadget clean. ​The material of The Nesco FD-80A is BPA free plastic. It ensures the food quality, odor free dehydration and also eradicates any possibility of sepsis. ​The adjustable thermostat allows the user to conduct his operation in a variety range of temperature of 90°F to 155°F. It is equally capable of dehydrating the green fruits, vegetables as well as jerky. ​Type of Dehydrator: The Nesco FD-80A is a stackable dehydrator, designed to perform with maximum eight shelves. ​Air Flow Mechanism: This gadget has horizontal air flow system. ​Temperature Range: The Nesco FD-80A has a wide temperature range of 90°F to 155°F. ​Product Dimension: The product is square shaped with a dimension of 15.2*10.2*15.6 inches. ​Adjustable Trays: It comes with four trays and can be adjusted four more trays in it. ​Thermostat: The Nesco FD-80A has an adjustable thermostat. ​Power Capacity: The power capacity of this gadget is 700 watts. ​Manufacturer Warranty: The Nesco FD-80A comes with one year of manufacturer warranty. ​Total Weight: Both the product weight and shipping weight is 9.2 pounds. The Nesco FD-80A have a converged-flow system to heat your jerky up. It ensures equivalent heating on each and every portion. Due to top fan, no dripping will take place. You will not need to move, rearrange or rotate your meat slices. The gadget will dehydrate them properly by itself. Provide a good surface for jerky making. Built with durable and high-quality materials. Easy to clean and the trays are dishwasher safe. Due to a top mounted fan, top tray foods will be a bit drier. Some consumer complained about the humming noise while dehydrating. ​The Nesco FD-80A has a good reputation for its dehydrating capability and interesting design. The price is pretty comfortable. The main drawback is the timer, but rather than that; it will be a right choice to make jerky. The top cover of the Presto 06300 Dehydro is transparent and made of strong polycarbonate. If you want to dehydrate some sensitive, thin or very fragile food item, you can easily keep it on the top tray and observe until you reach your desired level. The Presto 06300 Dehydro has a vertical airflow mechanism and a bottom fan which release warm air to dehydrate your food items. The heat emerges from the lower side, so if you need extra heat for some food items, you can keep them on the lower trays. The Presto 06300 Dehydro is an excellent product for the beginner dehydrator user as it is very much simple, easy to use and easy to clean as well. It is a great little family dehydrator. The Presto 06300 Dehydro is very simple dehydrator with four trays, but it is designed to occupy eight trays at a time which will provide a huge storage capacity. You will get four trays with the box, if you buy another four, you can dehydrate twice the food items at the same time. 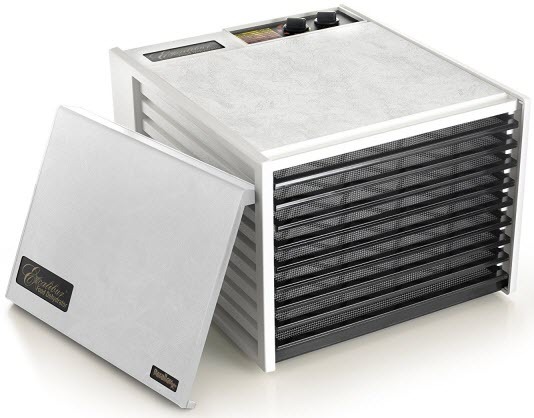 ​Type of Dehydrator: The Presto 06300 Dehydro is a stackable dehydrator with four trays. ​Air Flow Mechanism: It has vertical airflow system. Temperature Range: The temperature range is 135°F to 145°F. ​Product Dimension: The dimension of Presto 06300 Dehydro is 14.5*15*6.2 inches. Adjustable Trays: It has four trays with the box and capacity of holding eight trays altogether. Thermostat: It does not have any thermostat. Power Capacity: The Presto 06300 Dehydro requires 600 watts of power capacity. Manufacturer Warranty: It comes with one year of manufacturer warranty. Total Weight: The total weight of Presto 06300 Dehydro is 7.5 pounds with a shipping weight of 8 pounds. ​The Presto 06300 Dehydro is a very simple design. It does not have many features, but a good heating system and design have pulled it into our best dehydrators for making the jerky list. A simple gadget to make homemade jerky without costing a fortune or being a tech genius. The lower tray is suitable for your jerky because it possesses the maximum heat of the machine. Transparent cover to let you know the condition of your jerky. You can dehydrate it until it reaches your desired condition without opening the cover. Adjustable eight trays allow huge capacity. The trays are not high quality built. The basic marketing value of The Presto 06300 Dehydro is its simplest design with rarely low cost. If you want a dehydrator for your family, nothing high profile, high cost just to have some homemade jerky, then do not hesitate, and just go for this one. Remember the cons before buying it. ​With horizontal air flow system, the STX Dehydra-600W is very efficient, smooth and capable of dehydrating any food items within a short time compare to the other dehydrators on the market. The air circulation is good enough to ensure proper heating in every tray. ​The design of the STX Dehydra-600W includes a heat controlling knob which gives you the authority to control your desired temperature. It has a wide range of temperature which is very user-friendly to dehydrate any food items. ​Type of Dehydrator: The STX Dehydra-600W is a stackable dehydrator with ten trays. Air Flow Mechanism: It has horizontal air flow system, and the mechanism ensures similar heating in each of the ten trays. ​Temperature Range: The temperature range of the STX Dehydra-600W is from 85°F to 155°F. ​Product Dimension: This product comes with a comparatively bigger size with a dimension of 19*12.5*13.8 inches. ​Thermostat: The thermostat is present with a controlling knob. ​Power Capacity: It requires 600watts power to continue its dehydration process. ​Manufacturer Warranty: The STX Dehydra-600W comes with one year of manufacturer guarantee. ​Total Weight: Total weight of the STX Dehydra-600W is 22.5 pounds, and the shipping weight is 26.2 pounds. The heating system and the tray arrangement ensures proper and equivalent heat distribution which is very important for jerky making. Like the other dehydrator on the market, the STX Dehydra-600W does not fail to achieve its highest temperature. The balance of temperature is crucial. You won’t have to rotate the meat slice every after a while. Rear mounted fan ensures proper heating all over the trays. Require a huge space to settle. 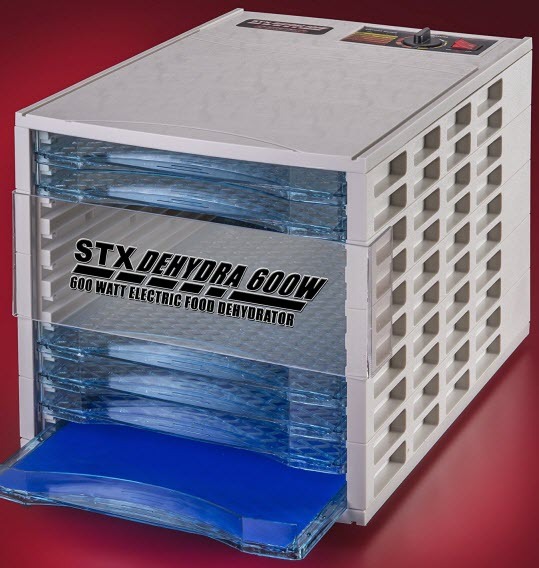 ​The STX Dehydra-600W is a very good dehydrator due to its excellent dehydration capacity. But the price is high and takes a lot of space which lowered its ranking as our primary target is to find out the best dehydrator for making beef or deer jerky. If you have to possess a lot of jerkies professionally and you have a handsome budget, you can surely go for it. The Waring Pro DHR30 has five trays in its box, but it can adjust up to 9 trays. It will allow you to dry a lot of food items at the same time. The adjustable thermostat is available in the gadget. You can control the temperature from 110°F to 175°F. ​Type of Dehydrator: The Waring Pro DHR30 is a stackable dehydrator. ​Air Flow Mechanism: The machine has a vertical airflow system and top mounted fan press the heat flow to the bottom. ​Temperature Range: The temperature range is from 110°F to 175°F. ​Product Dimension: The dimension is 14.7*12.4*11.8 inches. ​Adjustable Trays: Yes, you can adjust up to 9 trays at a time. ​Thermostat: Adjustable thermostat to control the temperature precisely. ​Power Capacity: The power capacity of The Waring Pro DHR30 is 620 watts. ​Manufacturer Warranty: The Waring Pro DHR30 is occupied with five years manufacturer warranty. ​Total Weight: The total weight of the product is 8.1 pounds, and the shipping weight is 9.6 pounds. The higher limit of the temperature is very good for jerky. The top tray of the dehydrator is a perfect place for the slice of meat. The dehydration quality is pretty good for a perfect jerky processing. You can use it to dry some non-food items to avoid moisture too. For the last couple of minutes, I have described top 10 best dehydrators for jerky making available on the current market. At the very beginning, I told you that I made a list considering three variables. They are Price, Features and Consumers Review. If you want to know my opinion, I can suggest you three best dehydrators depending upon these three parameters. ​It has all the common features, adjustable thermostat and occupies huge food items. It is also very easy to use and has a nice design to adjust with your kitchen appliances. The High-quality manufacturing of the product and the BPA-free plastic trays is a plus. A jerky lover will surely pay for such experience. ​If you are not worried about money, just want the best possible dehydrator of the market, I will like to show you Excalibur ﻿3926 TB. Q: What are the difference between the homemade jerky which prepared in the dehydrator and the one which we bought from the market? ​The market-bought jerky includes lots of sodium in it for preservation which is not good for health whereas the jerky which we prepared at home in the food dehydrator is nutritious. One more main difference is that the jerky which you made at home will be ready from the fresh meat. ​Q: I am a new user of the food dehydrator. Will it be easier for me to prepare jerky in the first attempt? ​Yes, you can easily make jerky in your food dehydrator. You just have to follow the instructions and the guidelines which stated in your cookbook provided along with your appliance. ​Q: I am following a strict diet nowadays to lose some weight. Can I consume the homemade jerky prepared in the food dehydrator or will it result in gaining weight? ​The jerky made in the food dehydrator does not allow raising your insulin in the body, and thus it does not lead to the formation of fat cells. Hence, if you are on the way of losing weight, then you can have this food without any worry. ​Q: What is a jerky gun which given along with some food dehydrators? ​A jerky gun is a kind of pantry handheld appliance which utilized in making thin shreds or round sticks of the meat. These strips and sticks of meat are then usually dry out into the jerky by the use of a food dehydrator. It also allows you to make some beautiful shapes of the jerky snacks which are not possible in the case of hand cut meat strips. ​Q: For making jerky in a food dehydrator what type of spices should use? ​Some of the manufacturers of the food dehydrator also provide some spices and seasonings along with the appliance. These herbs can be utilized while making jerky as it will add more flavors to your food in the end. ​Q: I love to travel on long trips or journeys. Can I take jerky with me so that it can work as a meal sometimes during the journey? ​Yes, of course, you can take jerky in your bag while traveling. It will not only make you feel full, but you will also relish its yummy taste. However, one thing you must remember that this food should be carried in an airtight container or a vacuum zip-bag. ​Q: From the cost point of view, the homemade jerky is expensive or the store bought? ​Apparently, the store bought jerky will be more costly and less nutritious to you as well as to your family. ​Q: What type of meat should we use for making beef jerky? ​You can use brisket, sirloin, flank or any other kind of lean meat which can quickly turn up. 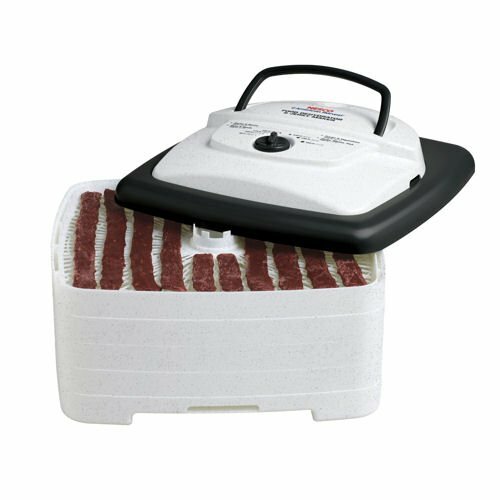 However, if you have a good food dehydrator, then you can use any meat for making beef jerky. ​Q: What precaution should we take while making jerky in the food dehydrator? ​At the beginning of the dehydrating process, you must heat your jerky up to the temperature of 160° to kill dangerous bacteria. The heating up of jerky afterward the dehydrating procedure may not eradicate all bacteria because it became more heat resilient throughout the drying method. That is why passing the jerky to the temperature of 160º at the beginning of the jerky making process is suggested by the United States Department of Agriculture (USDA). 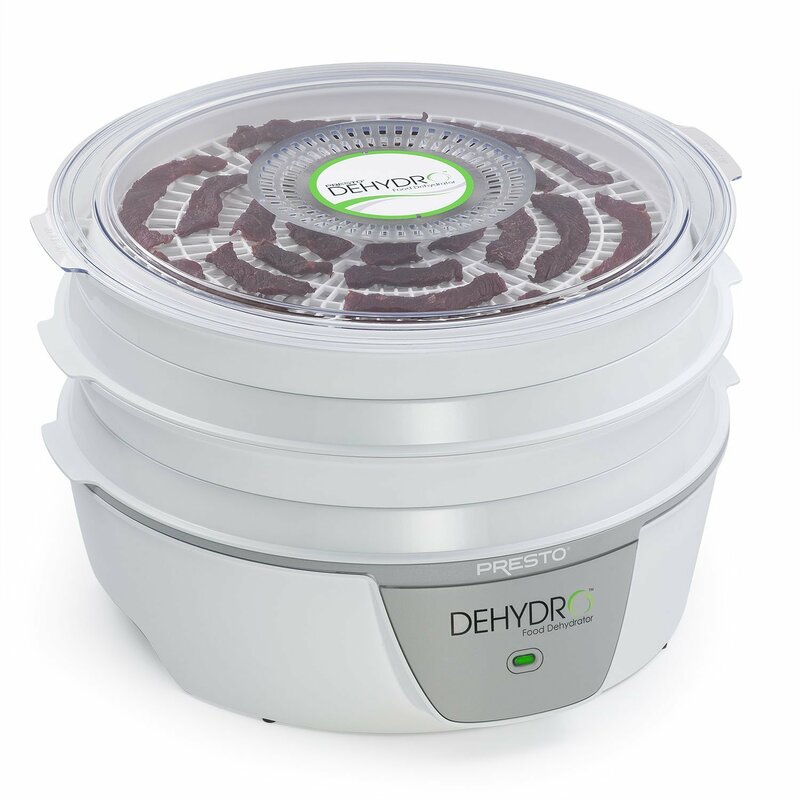 ​Q: How much time will it take in the food dehydrator to make jerky? It totally depends on the type and the brand of food dehydrator you are using for making jerky. It might take 5 to 8 hours which varies with the model of the appliance. ​Q: After making jerky in the food dehydrator, for how many months I can store it? You can store it usually in a freezer for one week, but for longer period i.e. around six months, you have to keep it in a vacuum sealed container or packet. Q: Can I purchase the jerky gun separately as the manufacturer of my food dehydrator has not provided it along with the appliance? ​Q: Is it beneficial to have a timer in a food dehydrator while making jerky? Jerky is a healthy snack full of protein and other valuable food ingredients. Do not deprive yourself of having this delicious food just because the readymade products contain too much sodium. Buy a dehydrator, control the salt and make your own appetizing but healthy snack. ​As your primary target is to make jerky, you have to be concern about some points. The first one is the price obviously. If you are an expert, you can cope up with any dehydrator. But for the beginner, a dehydrator with timer and thermostat will be much easier. If you need a huge amount of snack in one batch, consider the drying surface and adjustable trays, etc. Otherwise, do not bother much about these features and put more importance on the heating capability. If the heating capability is good, you will have a precisely processed jerky. ​Do not buy any dehydrator which is not BPA free. Hope this article will help you to find your desired dehydrator. Good Luck!